The thing to know about binoculars is there’s a lot to know about binoculars. With advances in optical technology, you can’t just go by price. Sure, the high-high-high-dollar binoculars have a lot of quality components and quality manufacturing standards built in, but more and more these days you can find quality components in quality-built binoculars without dipping into the kids’ inheritance. 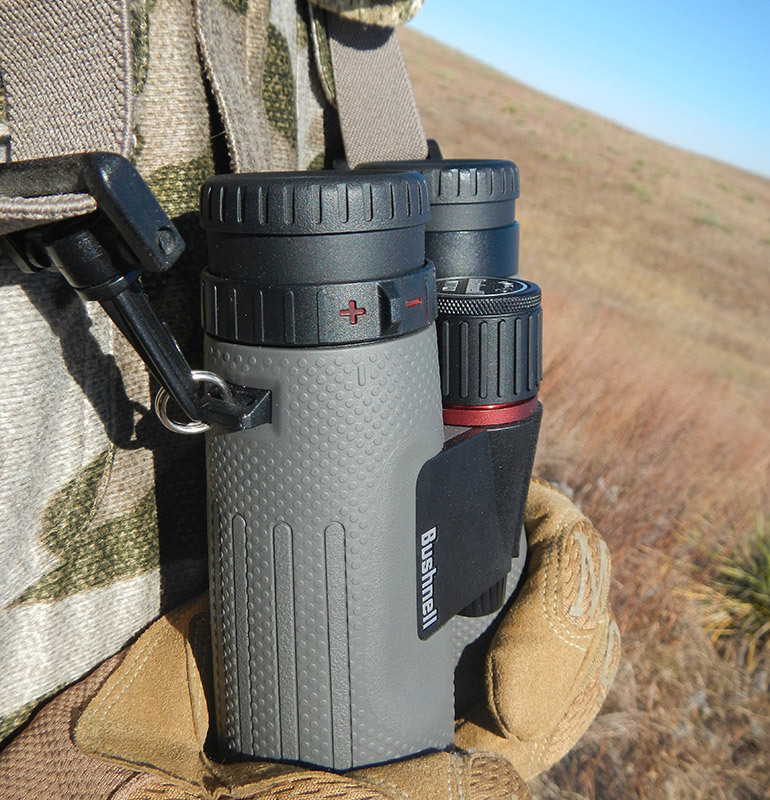 Bushnell takes a lot of the guesswork out of binocular shopping with their new series of binoculars, the Prime, Nitro and Forge, ascending in quality in that order; none of which will stun you with sticker shock. 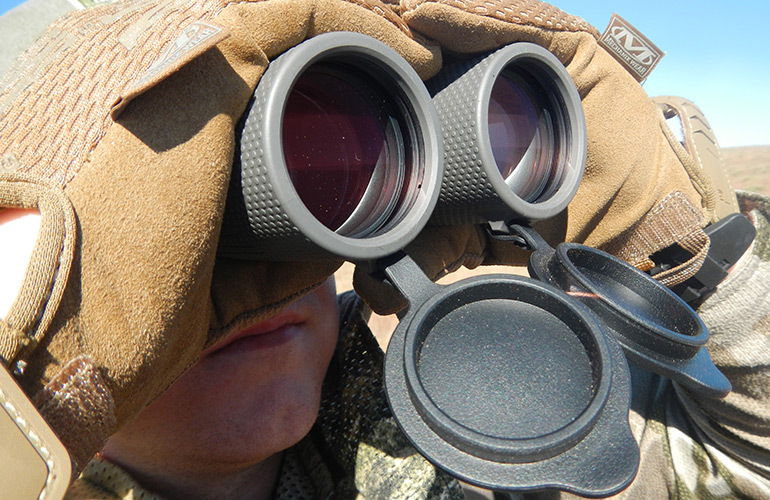 We’re going to take a deep dive into the Nitro binoculars but first it’s important to understand Bushnell’s thinking and what they are accomplishing with this tiered structure. So, in other words, with their tiered approach, they didn’t scrimp on design or components. “We wanted to offer an optic that offered the best combination of features at every price point so regardless of your competency level, thickness of your wallet, etc., there was an optic that would over-perform for you,” Rice said. There are differences as you move up the Prime, Nitro, Forge line, he said, particularly in better glass and more coatings as you go up. For instance, Prime has fully multi-coated lenses, whereas the Nitro bino has fully-multi coated plus P3C coating and ED Prime, he said. 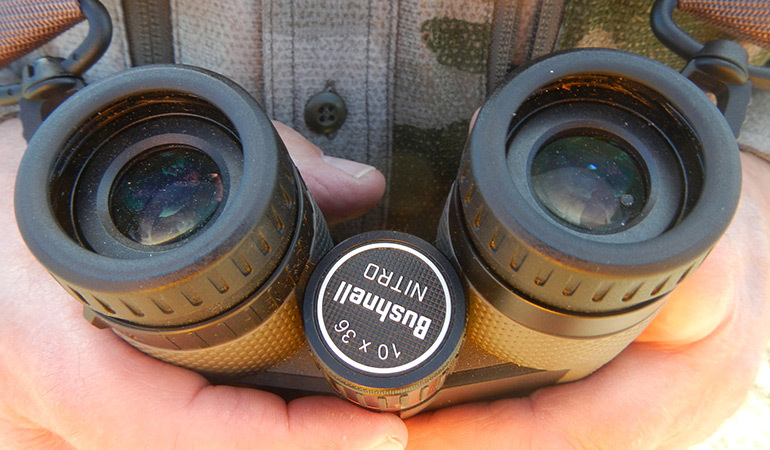 All these binoculars fit right in the wheelhouse of hunters and shooters, plus there is a strong crossover with nature watchers and those wanting reliable optics for general use. So, let’s look at the Nitro binoculars, starting with features Rice mentioned. EXO Barrier Protection – Unique to Bushnell, this is their newest, best protective lens coating that molecularly bonds to the glass, repelling water, fog, dust, debris and preventing scratches. PC-3 Phase Coating – This coating is applied to a surface on the roof prisms to ensure the light beams are brought back into alignment after passing through the prism, which enhances resolution and contrast of the image. ED Prime Glass Lenses – This is Bushnell’s highest quality, extra-low dispersion glass, utilized to eliminate chromatic aberration, which is a blue or purple haze seen around objects. When shopping for optics, you hear a lot about lens coatings, which is a more-is-better thing. That, in a pretty large nutshell, is what we’re talking about when we talk about what’s inside Nitro binoculars. Now, let’s look at the three models in the Nitro line. 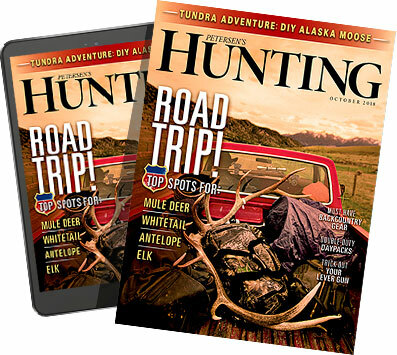 They all have 10-power magnification, the choice of many hunters and shooters, including me. They all share the same features in quality of construction but the differences start with size, most noticeably the size of the objective lenses and overall size. Essentially, the larger the objective lens, the more light the binocular will collect. The largest, with 42mm objective lenses, weighs 24.4 ounces, is 5.5 inches tall and has an MSRP of $419.95. In the middle, the 10x36mm model weighs 21.9 ounces and stands 4.8 inches. It retails for $349.95 and the $299.95 compact model features 25mm objective lenses and weighs just 9.4 ounces and stands 4.4 inches tall. In the field, the Nitros performed admirably. My youngest son, Sam, and I used them on a two-day coyote hunt in rolling hilly plains country where we could see for miles. On Day 1, Sam used the 10x42mm model, I used the 10x36mm model. On Day 2, we switched. Both provided sharp, clear views, both close up when scanning yucca and tall grass for sneaky coyotes and far off on distant ridges. They have a rubber-armor gun-metal gray coating that’s comfortable to grip. The focus knob is smooth and easily accessed and I appreciated the locking diopter ring which assures the setting couldn’t inadvertently be changed. 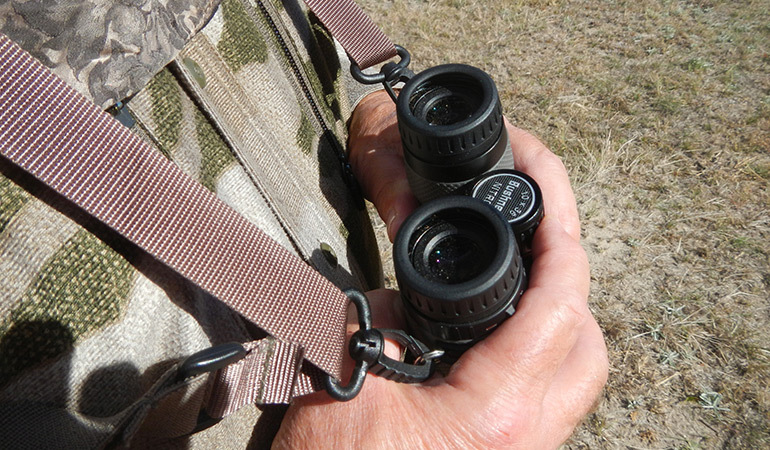 The 10x25mm compact model is ideally suited for hunting where you need sharp optics but don’t need the size and weight of larger binoculars; turkey hunting comes first to mind. I want to be able to see if the gobbler on that distant ridge is a true longbeard before I hike over there to make my play. But on the two larger models, we liked the size and heft, which helped provide steady viewing. And, since we strapped them on with chest harnesses, size and weight was never cumbersome, never a consideration. At one stand, we called for about 20 minutes but no coyotes appeared. I always glass an area before leaving and this is the perfect example why. I scanned left to right, close, mid-range and far distance. This was open prairie, cattle country, with rolling hills and an occasional windmill so there was a lot of country to scan. As I reached mid-point, at 12 o’clock straight out, I picked out a coyote sitting beside yucca plants on a ridge clear across the broad valley. The coyote was interested, but wary of the rabbit-distress sounds coming from our electronic caller. He sat and watched; I sat and watched. I slowly got out my rangefinder, which is good to 800 yards, but couldn’t pick up a range on the coyote. I’m not sure how far out he was, but he was out there. I whispered to Sam to try a howl and watched the coyote perk up, stand up and take a step forward, then set back down. Long story short, the coyote didn’t come in, but I watched him clearly from way across the valley and could pick out detail, right down to the skepticism on his face. 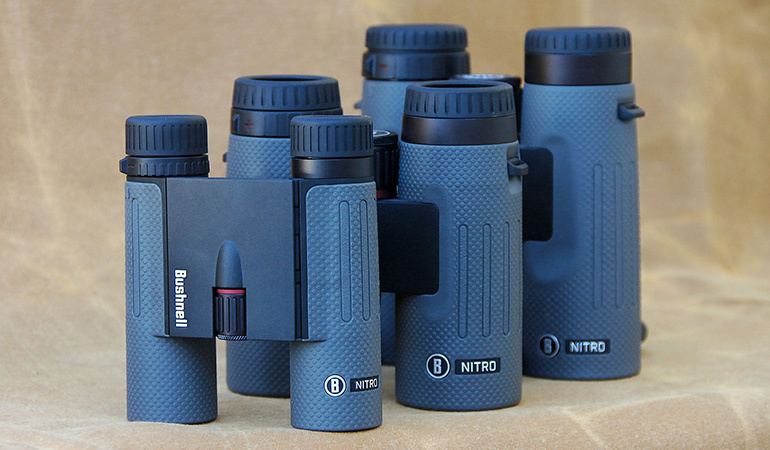 Another long story short, check out Bushnell Nitro binoculars at your outdoor-sports store or at bushnell.com.